Incentive Magazine recently published an article on the benefits of offering socially responsible products in incentive programs. In the article, they revealed that new generations are attracted to companies with strong reputations for environmental and community responsibility. Thus, by rewarding employees with socially responsible products (such as those produced by social enterprises), employees know they are helping other people. In a sense, this type of recognition serves several purposes. It recognizes employees, supports social enterprises and sends a powerful message to the community at large. The article featured the success of Helping Hand Rewards, an organization that connects social enterprises with corporations interested in purchasing corporate gifts and employee rewards that help give back to underserved groups and communities. Our President and CEO, Michael Arkes, is the founder of HHR. In the past five years, the number of companies interested in offering social enterprise products has grown significantly. In 2009, only three companies had a broad assortment of HHR products in their awards offerings. In 2010, that number more than doubled, and in 2011 that number will again double. Are you incorporating socially responsible products in your award assortment? As an employee, are you being offered socially responsible products in your award assortment? Why Social Responsibility? Why Now? You know you've got a buzzworthy term when it becomes a widely-spread acronym. 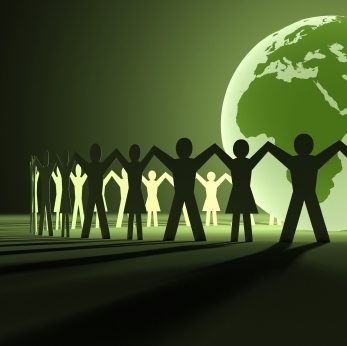 CSR - or corporate social responsibility - is one of those buzzworthy terms. CSR is a widely used hashtag on Twitter and a concept big companies are jumping on almost as rapidly as social media. Consumers, potential hires and even other companies measure another company's worth in regards to its triple bottom line. Why has CSR taken precedent all of a sudden in regards to good business practices? In many regards, brand image has a lot to do with it. Situations like what has happened with Enron/Adelphia-like companies (and more recently BP) have lowered the level of trust the public has with corporations. Lower trust = lower consumer confidence = lower brand value. Taking steps in social responsibility helps re-establish that trust, raise your brand value and build up that consumer confidence. So how have some companies jumped in on the socially responsible bandwagon? Of the bigger brands, Pepsi launced its Refresh Project. The company has sponsored a viral effort to encourage the sharing of good ideas that will help better the world we live in. If the idea receives enough votes, Pepsi donates money to start-up that idea and aid its launch. In this process, Pepsi has given away over $20 million to socially good ideas. This has helped Pepsi grow its digital fanbase and will most likely convert into more sales for the company. Other companies are incorporating social responsibility in their corporate gifts. In this Incentive Magazine article, Marriot utilized giving a washer basket from World of Good - a social enterprise helping overseas artisans create more sustainable lives - in their corporate gifting program. The article also discusses how other companies are utilizing products made by social enterprise groups to improve their employee incentive programs and boost their socially responsible practices simultaneously. CSR promotes better business practices and is becoming less of a novelty and more of a necessity in today's world. More consumers (and employees) are seeking out more than just a good product - they are seeking companies with a solid triple bottom line. The social responsibility train is moving full steam ahead. Are you on it?